THIS BLOG POST ORIGINALLY APPEARED ON BLOG.FH.ORG. WRITTEN BY KAREN RANDAU. 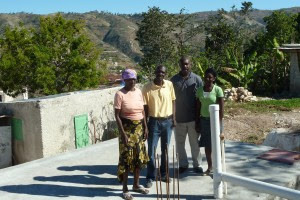 catchment tank that they partnered with FH to build for their community. I recently had the honor of meeting Madam Christian Jean Cimilien, a 67-year-old widow and mother of 11 grown children. 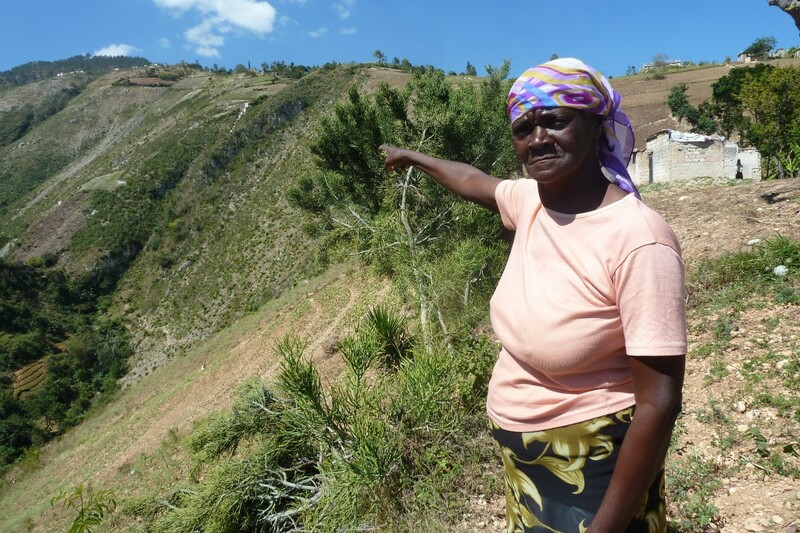 She’s a member of the community water management committee in Lefevre, Haiti. The community is working with Food for the Hungry (FH) to create a source of clean water by catching rain water. With this goal of having clean water, the community hopes to improve life for their children. Through her toothless grin, Madam Christian explained how FH collaborated with the community to determine that their biggest challenge was water. She was pleased that FH helped the community help itself. She clearly understood that handouts don’t last as long as learning to help yourself. The pride of ownership beamed from Madam Christian’s eyes as she pointed to the 12,779-gallon cement water tank. FH helped her and others in the community decide to place it near a church, on public property, so it would benefit everyone. Then the community helped by gathering the materials and working alongside FH to build the tank. Our group learned that other water catchment tanks had been built on nearby private property but later were claimed for the exclusive use of the property owners. As a result, women and children continued to spend long hours every day fetching water from a spring located down a steep hillside. the tank to bring life-sustaining water to their community. To help illustrate the arduous task, Madam Christian escorted our group part way down the narrow and rocky path that leads to the the community’s water source. Then she turned and pointed toward her garden several yards away. Multiple times every day, the community’s women and children take a 45-minute downhill trek, followed by a strenuous climb back up. They carry back as many buckets of water as they can. Each eight-pound gallon of water is used for drinking, bathing, cooking, sanitation and gardening. 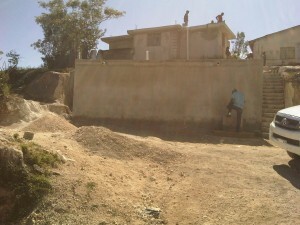 Children who barely have enough to eat spend their days hauling water up that hill. There is little energy or time left for school – or for being a child. How much water a family can carry determines the success of their garden. Gardens provide not only daily meals, but also the family’s income. Madam Christian stands on the rocky and narrow downhill trail pointing down toward her garden. Daily, she hikes down the hill to carry water from the spring to her garden. Then she carries water from the spring up the hill to her home to use for drinking, bathing, sanitation and cooking. You can help people like Madam Christian and the 894 million people worldwide who have inadequate access to improved water sources. Learn about global water issues and how organizations like FH are helping them. Support the work of organizations like FH that bring life-saving water to communities and children around the world.